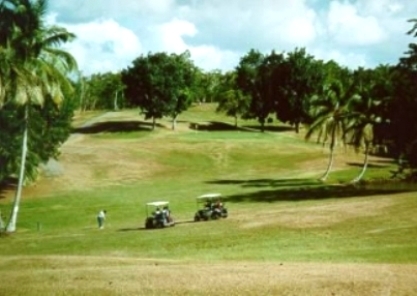 Club Deportivo del Oeste is a Semi-Private, 18 hole golf course located in Mayaguez, Puerto Rico. Club Deportivo del Oeste first opened for play in 1965. The Golf Course at Club Deportivo del Oeste was designed by Jack Bender. This course offers a panoramic ocean views. The signature hole is #1, a 575-yard, par 5, requiring a shot over water. You might want to warm up before playing #1. Club Deportivo Del Oeste is a private club located on the west coast of Puerto Rico about two and a half hours away from the capital, near Cabo Rojo in the Porta del Sol Region. One of the facilities available to both the public and to club members is the 18-hole championship golf course. This is a hilly course where you will find yourself with a downhill or uphill lie almost all of the time. The small greens are fast and the tight fairways are tree lined. Water hazards come into play on four holes.